That’s the unofficial guiding principle at SALT, the waterfront Shelter Island restaurant where you might spot an A-list comedian seated next to the neighborhood plumber. 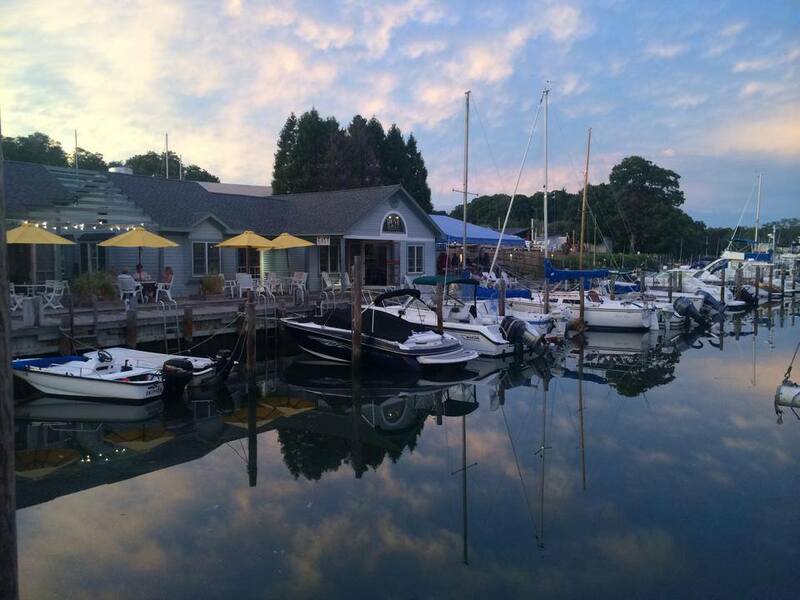 Since opening in 2012, SALT Waterfront Bar & Grill has prided itself on its “come as you are” policy, encouraging guests to secure their dinghies at the property’s floating dock and enjoy a cup of their locally famous clam chowder. Located next door to Island Boatyard and Marina, from which the Bavaros lease their property, SALT comprises a restaurant, private event room, retail store and outdoor bar. The latter, known as “The Shipwreck,” operates from a repurposed 39-foot schooner, offering live music and nautical-themed cocktails with names like “Whale Killer” and “Harelegger Punch.” Last year, SALT also began hosting weddings in conjunction with the boatyard at a fully renovated catering hall on the property. The restaurant, which is open from late April through October, features a menu as eclectic as its clientele. Crafted by executive chef Darren Boyle of East Hampton, it offers everything from local seafood and gyros to homemade Korean barbecue. “Our menu makes no sense, but it works,” Keith Bavaro quipped. Boyle, a 39-year-old Maryland native who has been executive chef at SALT for four years, trained at Johnson & Wales University, earning a bachelor’s degree in culinary arts at the school’s now-closed Charleston campus. While in college, he was a line cook at Charleston Place under then-executive chef Bob Waggoner, a four-time James Beard Award nominee. During his time in the South, Boyle also worked as a line cook at Hank’s Seafood on the Market, also in Charleston. In 2005, he accepted a position as sous chef at Inlet Seafood in Montauk — his wife, Leah’s, hometown. Soon after, the couple opened a restaurant called The Old Harbor House in the South Fork hamlet. It closed in 2008. In late 2008, Boyle accepted a position as senior saucier at The Ritz-Carlton in Key Biscayne, south of Miami. The job exposed him to a variety of international cuisines — particularly Peruvian, Middle Eastern and Asian — but the three-hour round-trip commute to the hotel from his home in Deerfield Beach, Fla., was “brutal,” he said. Four years into the job, Boyle found his way back to Long Island. Neither, it seems, did the Bavaros. Boyle, who has three young daughters, describes himself as a blue-collar guy who works 90 hours a week and “didn’t get anything handed to him.” This lack of entitlement makes him eager to reward his employees’ hard work. In the kitchen, Boyle and his staff concoct popular dishes like mussels miso, which features a broth made with ginger, jalapeño, garlic, shallots and a Port Jefferson Brewing Company beer brewed exclusively for SALT. The restaurant’s fried calamari, served with sweet chili sauce, spicy peanuts and cilantro, is another signature item. So are the hog wings made from the rear shank of a suckling pig. Everything at SALT, including desserts, is made on the premises, said Boyle. That includes the spicy boiled cabbage needed for his aforementioned Korean barbecue. While his taste buds are cultivated, Boyle is far from a food snob. You won’t find Oscar Mayer products in SALT’s kitchen. Boyle does, however, purchase goods from local purveyors like Blue Duck Bakery, Montauk Shellfish Company and Crescent Duck Farm in Aquebogue. He also frequently buys produce, including beets and zucchini, from Sang Lee Farms in Peconic. “If I’m in an area, I’ll grab it,” he said. While it might seem that Shelter Island’s geography lends itself to competition among restaurants, the Bavaros prefer to be practical. “We’re on an island; we get limited deliveries,” Keith Bavaro said. “It’s really important for us to have good working relationships with all the restaurants and to know that we can go to them and they can always come to us.